In 1957, Tunisia introduced 117 species of Eucalyptus; they have been used as fire wood, for the production of mine wood and to fight erosion. Actually, Eucalyptus essential oil is traditionally used to treat respiratory tract disorders such as pharyngitis, bronchitis, and sinusitis. A few investigations were reported on the biological activities of Eucalyptus oils worldwide. In Tunisia, our previous works conducted in 2010 and 2011 had been the first reports to study the antibacterial activities against reference strains. At that time it was not possible to evaluate their antimicrobial activities against clinical bacterial strains and other pathogens such as virus and fungi. The essential oils of eight Eucalyptus species harvested from the Jbel Abderrahman, Korbous (North East Tunisia) and Souinet arboreta (North of Tunisia) were evaluated for their antimicrobial activities by disc diffusion and microbroth dilution methods against seven bacterial isolates: Haemophilus influenzae, Klebsiella pneumoniae, Pseudomonas aeruginosa, Staphylococcus aureus, Streptococcus agalactiae, Streptococcus pneumoniae and Streptococcus pyogenes. In addition, the bactericidal, fungicidal and the antiviral activities of the tested oils were carried out. Twenty five components were identified by GC/FID and GC/MS. These components were used to correlate with the biological activities of the tested oils. The chemical principal component analysis identified three groups, each of them constituted a chemotype. According to the values of zone diameter and percentage of the inhibition (zdi, % I, respectively), four groups and subgroups of bacterial strains and three groups of fungal strains were characterized by their sensitivity levels to Eucalyptus oils. The cytotoxic effect and the antiviral activity varied significantly within Eucalyptus species oils. E. odorata showed the strongest activity against S. aureus, H. influenzae, S. agalactiae, S. pyogenes, S. pneumoniae and against all the tested fungal strains. In addition, E. odorata oil showed the most cytotoxic effect. However, the best antiviral activity appeared with E. bicostata. Virus pretreatment with E. bicostata essential oil showed better antiviral activity (IC50 = 0.7 mg/ml, SI = 22.8) than cell-pretreatment (IC50 = 4.8 mg/ml, SI = 3.33). The essential oil of E. astringens showed antiviral activity only when incubated with virus prior to cell infection. This activity was dose-dependent and the antiviral activity diminished with the decreasing essential oil concentration. The Eucalyptus, a native genus from Australia, belongs to Myrtaceae family and comprises about 900 species . More than 300 species of this genus contain volatile oils in their leaves. Fewer than 20, within these species, known for their high content of 1,8-cineole (more than 70%), have been commercially used for the production of essential oils in pharmaceutical and cosmetic industries . Over the past few years, the interest in natural medicine has been increasing in industrialized societies particularly against microbial agents because of the ever growing problem of antibiotic resistance . In Tunisian folk medicine, inhalation of Eucalyptus sp. essential oil has traditionally been used to treat respiratory tract disorders such as pharyngitis, bronchitis, and sinusitis . Consequently, the scientific interest in this field has been expanding. Some researchers have demonstrated some efficacy of Eucalyptus globulus essential oil against Haemophilus influenzae and Stenotrophomonas maltophilla[3, 5]. Streptococcus pyogenes, Streptococcus pneumoniae, Streptococcus agalctia, Staphylococcus aureus, Pseudomonas aeruginosa, Klebsiella pneumonia and Hemophilis influenzae are the most important causes of the respiratory tract infections and the most resistant to antibiotics. Many studies reported the antifungal propriety of plant extracts and essential oils against dermatophytes, filamentous and Candida albicans[6, 7]. The essential oils extracted from Eucalyptus species, mainly from E. urophylla S.T. Blake, E. grandis, E. camaldulensis, E. citriodora and E. globulus were found to be active on phyto-pathogenic fungi [8–10]. Few studies have reported the antiviral activity of Eucalyptus essential oils against Adenovirus, mumps and herpes simplex viruses [11, 12]. One of the major challenges is the practical use of these essential oils in vivo. This is difficult and needs to be overcome by trial assays. The importance of the antiviral activity of natural compounds is their perspective uses against these pathogens. Enteroviruses are more prevalent in the environment than the viruses discussed above and it is worth studying them for any antiviral activity. To the best of our knowledge, there is no published report on the Eucalyptus essential oils’ activities against human fungal and enteroviral infections. As reported previously [13, 14], we have studied the antibacterial activity of 35 Eucalyptus essential oils against four reference gastrointestinal strains (Esherichia coli, ATCC 25922; Pseudomonas aeruginosa, ATCC 227853; Enterococcus faecalis, ATCC 292112; Staphylococcus aureus, ATCC 25932) using the disc diffusion method. On the basis of the best diameter inhibition against these pathogens, eight Eucalyptus essential oils were selected and used to evaluate their activity against bacterial strains isolated from patients suffering respiratory infections. In addition, these oils were tested for their antifungal and anti-enteroviral activities. Samples of clean mature leaves of eight species of the genus Eucalyptus L’HÉR., five of which were collected in June 2006 from Souiniat arboreta located in the North west of Tunisia (E. bicostata, E. cinerea, E. maidenii, E. odorata and E. sideroxylon); two species were collected in April 2006 from Korbous arboreta (E. astringens and E. lahmannii); one species was collected from Jbel abderrahaman arboreta (E. leucoxylon). The last two arboreta were located in Nabeul region (North East of Tunisia with sub-humid bioclimatic stage). Botanical voucher specimens have been deposited in the Pharmacognosy Laboratory Herbarium in the Faculty of Pharmacy (Monastir, Tunisia), under the following references: 0119, 0120, 0126, 0127, 0129, 0132, 0138 and 0154. The extraction of essential oils was carried out by hydro-distillation during four hours, using a standard apparatus recommended in the European Pharmacopoeia. We made three attempts for each sample of 100 g of boorishly crushed dried leaves for each species. The oil collected from each plant was then dehydrated with Na2SO4 (Sigma-Aldrich, NY, USA) and stored at 4°C until use. Quantitative and qualitative data for all the essential oils were performed in triplicate by Gaz Chromatography (GC) and Gaz Chromatography coupled with the Mass Spectroscopy (GC/MS), respectively. GC was carried out using Hewlett-Packard (HP) 6890 chromatography apparatus equipped with Flame Ionization Detector (FID) and Carbowax column (30 m x 0.32 mm i.d., film thickness 0.25 μm) under the following analytical conditions: injector and detector temperatures were maintained at 250°C and 280°C, respectively; oven temperature programmed to rise from 35°C to 250°C at 5°C/min, isothermal temperature 35°C for 1 min and 250°C for 3 min; the carrier gas was nitrogen with a flow rate of 1.2 mL/min., the injected volume was 1 μL sample of 10% solution of oil in purified hexane. Relative concentrations were calculated using the software HP Chemstation, which allows the assimilation of the percentages of the peak areas to the percentages of the various constituents. Retention indices were obtained by running a series of aliphatic hydrocarbons (C9 - C28) by increasing the number of carbon atoms in the Carbowax GC column). The chemical analysis of the essential oils was carried out using a HP 5890 series II gas chromatography apparatus equipped with a polar column Carbowax (30 m x 0.32 mm i.d., film thickness 0.25 μm) and 5972 mass selective detectors. Helium was used as the carrier gas. The mass spectrometer operating conditions were: ionisation voltage, 70 eV, ion source 230°C. The GC/MS parameters were identical to those for the GC analysis. The identification of the compounds was based on the comparison of their retention index (determined relatively to the retention time of aliphatic hydrocarbons (C9 - C28) and of the mass spectra with those of authentic compounds by means of NBS75K.L. and Wiley 275 databases and with the literature data) . The bacterial strains used in the present study were seven clinical bacterial isolates: Haemophilus influenzae (11 strains), Klebsiella pneumoniae (13 strains), Pseudomonas aeruginosa (10 strains), Staphylococcus aureus (17 strains), Streptococcus agalactiae (9 strains), Streptococcus pneumoniae (19 strains) and Streptococcus pyogenes (2 strains). These clinical strains were obtained from Microbiology and Immunology Laboratory (EPS Farhat Hachad, Sousse, Tunisia). The antibacterial activity of the different essential oils was evaluated by the paper-disc agar diffusion method with a bacterial inoculum of 0.5 Mcfarland; Mueller-Hinton (MH) with 5% sheep blood or with MH only for Pseudomonas aeruginosa, and Staphylococcus aureus. Absorbent discs (Whatman disc n°3, 6 mm diameter) were impregnated with 10 μL of each oil, and then placed on the surface of inoculated plates (90 mm). Positive control discs of antibiotics commonly used for the treatment of respiratory tract diseases were tested. After 24 h of incubation at 37°C, the inhibition zones were measured and expressed in mm. All experiments were done in triplicate. The minimal inhibition concentration (MIC) was studied only with oils which were proved to effective using the disc diffusion method (inhibition zones ≥ 17 mm). MIC was determined using micro-well dilution method according to the protocol of Şahin et al. (2004) . The 96-well plates were prepared by dispensing into each well 95 μL of nutrient broth and 5 μL of the inoculum. One-hundred microliters from each extract were initially prepared at a concentration of 0.166 (v/v) and added into the first well, followed by two-fold dilution until the 9th well. The wells of column 10 were filled with 195 μL of MH broth and reserved for the bacterial growth control, whereas the 11th column wells were reserved for the control of the broth sterility. The wells of the last column were used as a negative control, and contained 195 μL of nutrient broth and 5 μL of the inoculum. The plates were screened visually after incubation at 37°C for 24 h for broth turbidity. The minimum bactericidal concentration (MBC) is the lowest concentration of the essential oil that can kill 99.9% of the bacterial population after incubation for 18–24 h at 37°C [17, 18]. It was calculated by inoculating the content of the well indicating the MIC and the wells that precede it in an agar plate. Seven Eucalyptus essential oils were tested against five fungal strains that comprise one opportunist pathogenic yeast (Candida albicans), one filamentous (Scopulariopsis brevicaulis) and three dermatophytes (Trichophyton rubrum, Trichophyton soudanense, Microsporum canis). The micro-organisms were obtained from the Laboratory of the Transmissible Diseases and Biological Active Substances LR99ES27 (Faculty of Pharmacy of Monastir, Tunisia). Antifungal activity was carried out by the agar incorporation method (dilution in a solid medium) including a negative control, as described previously by Bel Haj Salah et al. (2006) . The test was performed in sterile Petri dishes (33 mm) containing Sabouraud Glucose Agar (SGA). Samples were mixed with ethanol 99% (v/v) to obtain a final concentration of 1000 μL/mL. This solvent was also used as a negative control. After cooling and solidification, the medium was inoculated with a small amount (5 mm) of a 7 day-old mycelium culture (for dermatophytes), a three days culture suspension adjusted to 105 conidies/mL (Scopulariopsis brevicaulis) or a 3 day culture suspended in sterile distilled water and adjusted to 105 spores/ml (for yeasts). The pevaryl was used as anti-fungal reference. The Petri dishes were then incubated for additional seven days at 24°C for dermatophytes and for the filamentous, 24 h at 37°C for Candida. Three replications were carried out for each concentration and for each micro-organism. The antifungal activity of the essential oils was evaluated by calculating the percentage of inhibition (% I) from the diameters of colonies in the control plate (dC) and the colonies in the treated plate (dE); % I = (dC - dE)/dC, according to the method of Singh et al. (1993) . The evaluation of the cytotoxic effect of samples is based on the reduction of MTT (3-[4,5-dimethylthiazol-2-yl]-2,5-diphenyl tetrazolium bromide), by the mitochondrial dehydrogenase of viable cells, to give a blue formazan product which can be measured spectrophotometrically at 540 nm. The MTT colorimetric assay was performed in 96-well plates. Cells were seeded in 96-well plates at a concentration of 105 cells per well and incubated for 24 h at 37°C in a 5% CO2 humidified atmosphere. After treatment with various concentrations of the test compound, the cells were incubated for an additional 48 h at 37°C. The cells were examined daily under a phase-contrast microscope to determine the minimum concentration of compounds that induced alterations in cell morphology. After that, the medium was removed and cells in each well were incubated with 100 μL of MTT solution (5 mg/mL) for 3–4 h at 37°C. Fifty microliters of dimethyl sulfoxide (DMSO) were then added to dissolve insoluble formazan crystal and the plates were incubated at 37°C for 30 min. Optical density (OD) was measured at 540 nm using a Perkin-Elmer ELISA reader (HTS 7000 plus). Data were obtained from duplicate wells. Cell viability was expressed with respect to the absorbance of the control wells (untreated cells), which were considered as 100% of absorbance. The percentage of cytotoxicity is calculated as [(A - B)/A] x 100, where A and B are the OD540 of untreated and of treated cells, respectively. The percentage of viability was carried out using the formula: 100 - % cytotoxicity. The 50% cytotoxic concentration (CC50) was defined as the compound’s concentration (μg/mL) required for the reduction of cell viability by 50%, which were calculated by regression analysis [y = f(x); where y = % viability and x = concentration of extract, μg/mL]. The used definition of the cytotoxicity, as supported by other reports  was; CC50 < 1.0 μg/mL – high cytotoxicity; CC50 = 1.0-10.0 μg/mL – moderate; CC50 = 10.0 - 20.0 μg/mL – mild cytotoxicity; and CC50 > 20 μg/mL – non cytotoxic. Cell culture and virus. The Vero cell line was maintained in RPMI 1640 (Gibco, Tunisia) supplemented to fetal bovine serum (10%, v/v), L-Glutamin (2 mM), penicillin (100 U/mL), and streptomycin (100 μg/mL). Cells were incubated at 37°C in a 5% CO2 humidified atmosphere. Coxsakievirus B3 Nancy strain (kindly provided by Pr. Bruno Pozzetto, Laboratory of Bacteriology-Virology, Saint-Etienne, France) was propagated in Vero cells. Confluent Vero cell cultures were treated with three non cytotoxic concentrations of the essential oil during and after virus infection in two sets of experiments as follows: (1) 5 x 104 TCID50 of the virus was exposed to essential oil for one hr at 37°C. Then 100 μL of the mixture were added to the cells cultured fluently in 96-well flat-bottom microtiter plate (100 μL); (2) Cells were treated with essential oil (100 μL) for one hr at 37°C. After one hr of incubation at 37°C, 5 x 104 TCID50 of the virus (100 μL) were added. Where (ODT), (ODC) V and (ODC) M indicate absorbance of the test sample, the virus-infected control (no compound) and mock-infected control (no virus and no compound), respectively. The 50% inhibition concentration (IC50) was calculated by regression curve analysis, which is defined as the concentration of the essential oil that inhibits the viral infection by 50% . The data were analyzed using analysis of variance (ANOVA). The significance of the differences between means was determined at p < 0.05 using Duncan's multiple range tests. Results were expressed as means ± Standard Deviation (SD). To evaluate whether the identified components may be useful in reflecting chemotaxonomic and biological activities relationships, 25 compounds detected in the oil samples at an average concentration greater than 0.9% of the total oil were selected and used for this purpose. Both of these components and all the values of the essential oils zone diameters of bacteria growth inhibition were subjected to a principal component analysis (PCA) and to hierarchical cluster analysis (HCA) using SPSS 12.0 software (SPSS Inc. Chicago, IL, USA). To evaluate the antiviral activity in vitro, the selectivity index (SI = CC50/IC50) was determined. The selectivity index describes the ratio between the cytotoxic and the antiviral activity of a tested compound. The chromatographic analysis (GC retention index (RI) and GC/MS) of the essential oils allowed the identification of 144 components representing 87.40 to 99.37% of the total oil content [23–25]. Twenty five major compounds at an average concentration greater than 0.9 ± 0,2% have been retained for the statistical analysis (Table 1). The main components were 1,8-cineole (4.5 ± 1,61 -70.4 ± 2.5%) followed by cryptone (0.0 - 20.9 ± 1.3%), α-pinene (1.0 ± 0.7 - 17.6 ± 7.5%), p-cymene (0.8 ± 0.1 - 16.7 ± 5.2%), α-terpineol (0,6 ± 0,3 - 10,3 ± 1,1%), trans-pinaocarveol (0.8 ± 0.2 - 7.0 ± 2.5%), phellandral (0.0 - 6.6 ± 0.4%), cuminal (0.0 - 6.6 ± 0,6%), globulol (0.6 ± 0.2 - 6.2 ± 0.9%), limonene (0.4 ± 0.2 - 4.4 ± 0.3%), aromadendrene (0.1 ± 0.0 - 3.6 ± 1.2%), sapthulenol (0.1 ± 0.1 - 3.2 ± 0.9%) and terpinene-4-ol (0.3 ± 0.1 - 3.0 ± 0.8%). a Values are means ± SD of triplicate determination. b E.maid = E. maidenii, E. cin = E. cinerea, E. Sid = E. sideroxylon, E. odo = E. odorata, E. bic = E. bicostata, E. leh = E. lehmannii, E. ast = E. astringens, E. leuc = E. leucoxylon. The yield content of the 25 selected component was significantly different (p < 0.05) among species (Table 1). These 25 components were used for the PCA and the HCA analysis. The PCA horizontal axis explained 47.2% of the total variance while the vertical axis a further 23.80% (Figure 1). The HCA based on the Euclidean distance between groups indicated three specie groups (A, B and C) (with a dissimilarity of 11.0) (Figure 2), identified by their essential oil chemotypes. Group A clearly stood out forming a separate group in the PCA (Figure 1) and a deep dichotomy in the HCA (Figure 2). It was correlated positively with the axes 1 and 2. Groups A and B were negatively correlated, their separation was mainly due to axis 2. Group A species reduced to E. odorata, the essential oil of which was characterized by the highest mean percentage of cryptone (20.9 ± 1.3%), cuminal (6.6 ± 0.6%), phellandral (6.6 ± 0.4%), verbenone (0.9 ± 0.2%), p-cymen-8-ol (2.9 ± 0.6%), sapthulenol (3.2 ± 0.9%), carvacrol (1.7 ± 0.3%), p-cymene (16.7 ± 5.2%), terpinene-4-ol (3.0 ± 0.8%), caryophyllene oxyde (1.7 ± 0.2%), viridiflorol (4.5 ± 1.6%) and by the lowest level of 1,8-cineole (4.5 ± 1.6%). Group B, made up of E. maidenii, E. lehmannii, E. sideroxylon and E. cinerea, has essential oils characterized by the highest amount of limonene (3.1 ± 0.2 to 4.4 ± 0.2%), α-terpineol (2.2 ± 0.3% for E. maidenii to 10.3 ± 1.1% for E. cinerea). The PCA showed that the variation between these species is mainly due to the variation of 1,8-cineole content (57.8 ± 1.9% for E. maidenii to 70.4 ± 2.5 for E. cinerea) and of α-pinene (4.5 ± 0.7% for E. cinerea to 17.6 ± 7.5% for E. lehmannii). Group C, consisting of E. astringens, E. leucoxylon and E. bicostata, has essential oils distinguished by their highest mean percentage of epiglobulol (1.0 ± 0.2 - 1.2 ± 0.3%), globulol (5.4 ± 1.2 - 6.2 ± 0.9%), trans-pinocarveol (4.3 ± 1.0 to 7.0 ± 2.5%), aromadendrene (2.0 ± 0.8 - 3.6 ± 1.2%) and pinocarvone (1.2 ± 0.2 - 2.2 ± 0.5%). The E. bicostata and E. leucoxylon oils differed from E. astringens oil by their richness in 1,8-cineole (68.0 ± 5.3, 59.2 ± 10.1%, respectively) and their poverty in α-pinene (3.7 ± 1.2, 7.8 ± 2.3%, respectively) against 42.0 ± 5.9% and 22.0 ± 6.0%, respectively for the latter species. ACP of the 26 major components of eight eucalyptus essential oils. For the abbreviation of Eucalyptus species (▴) and components (●) see Table 1. Dendrogram obtained by hierarchical cluster analysis based on the Euclidean distance between groups of leaf essential oils of eight Tunisian Eucalyptus species. Components that characterise the major sub groups, considered as chemotypes, are indicated. As in the present study, E. cinerea, E. sideroxylon, E. bicostata, E. maidenii, E. leucoxylon, E. lehmannii and E. astringens have been reported to contain 1,8-cineole as a major component [26–30]. It was also reported that E. cinerea grown in Morocco contained a higher mean percentage of 1,8-cineole (87.8%) than that from Tunisia (70.4-2.5%) , whereas E. sideroxylon acclimated in Tunisia was richer in 1,8-cineole (69.2-0.6%) than that from Congo (59.9%) . The Tunisian E. astringens essential oil had the same chemotype as that extracted from leaves picked from Moroccan tree plantations with an important difference in their mean percentages. Both of them were different from the Australian E. astringens essential oil , which was represented by β-caryophyllene (14.75%), p-cymene (17.72%), and α-pinene (12.53%). The same principal components were also observed in E. leucoxylon essential oil [33, 34], whereas the essential oil obtained from Iran was significantly richer in 1,8-cineole (89.8%) than that from Tunisia . The essential oils were tested for their putative antibacterial activity against seven bacterial isolates represented by 81 strains (Table 2). As shown in Table 2, E. odorata oil possessed the best activity against S. aureus (27.4 ± 10.7 mm, zdi), followed by S. agalactiae (19.4 ± 5.6 mm, zdi), H. influenzae (19.2 ± 9.6 mm, zdi), S. pyogenes (19.0 ± 0.0 mm, zdi) and S. pneumoniae (17.4 ± 4.1 mm, zdi). E. maidenii oil showed a relatively good activity against S. aureus (22.8 ± 6.8 mm, zdi). 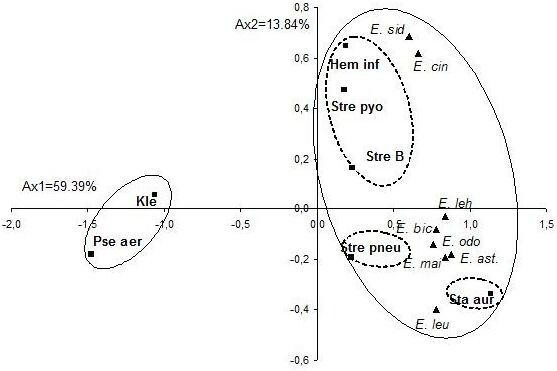 To evaluate the correlation between the antibacterial activities and the essential oils of the eight Eucalyptus species, all the mean values of the zone diameters inhibition were subject to the PCA and the HCA analysis. The statistical analysis of the antibacterial activities of the oils showed a significant difference among Eucalyptus species oils and the tested bacterial strains (p < 0.05). The PCA horizontal axis explained 59.39% of the total variance, while the vertical axis a further 13.84% (Figure 3). 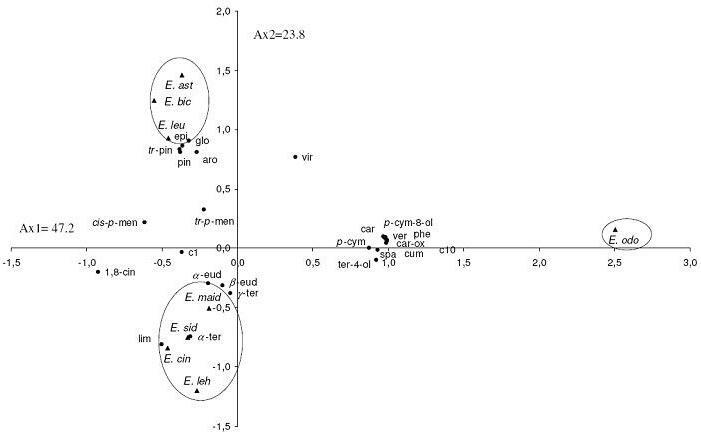 The HCA showed two species groups (I and II), identified by their bacteria growth inhibition with a dissimilarity ≥ 15.0 (Figure 4). When the dissimilarity was ≥ 5.0, group II was divided into three subgroups (IIa, IIb and IIc). The horizontal axis permitted the separation of group I from group II, however axis II separated all the species of the group II into three subgroups. Group I, limited to the Gram negative (Gram(−)) bacteria, P. aeruginosa and K. pneumoniae, forms a deep dichotomy within the HCA analysis and a clearly separated group in the PCA analysis. These two strains were the most resistant to the majority of Eucalyptus essential oils with zdi < 7.1 mm for P. aeruginosa and 10.7 ± 1.5 mm for K. pneumoniae. Compared to the growth inhibition zone produced by ciprofloxacin against P. aeruginosa (34.7 ± 5.0 mm, zdi) and K. pneumoniae (32.4 ± 2.9 mm, zdi). Subgroup Ia was limited to S. aureus which was characterized by the highest sensitivity to E. maidenii and E. odorata oils (22.8 ± 6.8 and 27.4 ± 10.7 mm, zdi, respectively). This high sensitivity could be due to the disposition of E. maidenii and E. odorata oils with a relatively high mean percentage of the monoterpene hydrocarbons p-cymene (7.4 ± 2.9, 16.7 ± 5.2%, respectively). Previous studies have reported the high sensitive character of S. aureus to essential oils with a high content of p-cymene . In addition, other researchers reported that this sensitivity of S. aureus was due to the single layer wall of the bacteria . Comparing these results with those obtained with antibiotics, E. odorata essential oil produced a similar inhibition to that produced by gentamicin, erythromycin, vancomycin and benzylpenicillin (29.6 ± 6.2, 29.9 ± 5.1, 25.3 ± 4.4 and 24.5 ± 7.5 mm, dzi, respectively). However, this activity remained lower than that produced by fosfomycin (34.3 ± 11.1 mm, dzi). Sub group IIb represented by S. pneumoniae, showed a particular sensitivity to E. odorata and E. bicostata essential oils (17.4 ± 4.1 and 17.0 ± 4.0 mm, zdi). This inhibition remained lower than that produced by its specific antibiotics with zone diameters inhibition ranging from 26.3 ± 12.0 mm (erythromycin) to 35.6 ± 5.5 mm (fosfomycin). E. lehmannii, E. sideroxylon and E. cinerea oils did not show significant antibacterial activities with inhibition zones of 9.8 ± 2.4, 10.7 ± 2.5 and 11.5 ± 2.8 mm, respectively. Subgroup IIc, consists of Streptococcus B, S. pyogenes and H. influenzae. These strains were separated from all the others and correlated positively with the two axes and with E. cinerea and E. sideroxylon, the essential oils of which were characterized by a comparable activity against the previous bacterial strains, with inhibition zone diameters varying from 11.6 ± 1.4 mm to 13.0 ± 6.3 mm. Their activities were considered relatively as being lower than the tested antibiotics such as rifamicine and ampicilline. However E. odorata oil, which was removed from this group, showed the best activity against these bacterial strains with inhibition zone diameters varying from 17.4 ± 4.1 mm for S. pneumoniae to 19.4 ± 5.6 for Streptococcus B, but it remained much lower than that produced by their specific antibiotics. The MIC was performed for oils which have produced an inhibition ≥ 17 mm for clinical bacterial strains such as H. influenzae (reference 160), S. agalactiae (reference 3) S. pyogenes (reference 545) and S. aureus (reference 278). The result of their MIC was listed in Table 3. E. odorata and E. bicostata oils were characterized by the lowest MIC for Hemophylis influenzae (reference 160) (0.306 mg/mL), followed by S. agalactiae (reference 3) (10.4 mg/mL). These results were confirmed by the disc diffusion method. The highest MIC against S. aureus ( reference 278) was shown for the oils of E. bicostata (169 mg/mL), E. odorata (156.6 mg/mL) and E. maidenii (151.8 mg/mL). This finding was in contradiction to results obtained by the disc diffusion method. According to the classification of Schaechter et al. (1999)  and Soro et al. (2010) , E. odorata, E. bicosta and E. maidenii oils were considered bactericidal (MBC/MIC < 4) against the tested strains, however the two first oils showed a better bactericidal activity against H. influenzae (reference 160) and S. aureus (reference 278) than that obtained with S. pyogens (reference 545) and S. aglatctiae (reference 3). *Values are means (mm. ±SD) of triplicate determination. ·) Values with different letters differ significantly by Duncan's multiple range test (p < 0.05). PCA of the antibacterial activity of 0 8 Eucalyptus essential oils species against seven clinical bacteria (■). For the abbreviation of the Eucalyptus species (▴) see Table 1.■) Hem inf = Haemophylis influenza, kle = Klebsiella pneumoniae = Pse aer: Pseudomans aeruginosa, sta aur = Staphylococcus aureus, Stre B = Streptococcus agalactiae, Stre pneu = Streptococcus pneumoniae, Strep pyo = Streptococcus pyogenes. Dendrogram obtained by hierarchical cluster analysis based on the Euclidean distance between groups of the antibacterial activities of leaf essential oils of eight Tunisian Eucalyptus species. For the abbreviation of the Eucalyptus species (▴), see Table 1.
a): H. inf 160 = Hemophylus influenza (160); Strep B3 = Streptococus B3 = Streptococcus agalactiae 3; S.pyo 545 = Streptoccus pyogenes; S.aur 278 = Staphylococcus aureus. b): values were expressed as mg/ml; NT = Not tested. Seven Eucalyptus oils were tested for their antifungal and anti-yeast activities. The result of their average percentages inhibition was listed in Table 4. Their variance analysis showed a highly significant effect for all oils (p < 0.05), except for E. odorata and E. cinerea oils (p > 0.05). *) Values were expressed as a percentage of inhibition ± SD at the concentration 1000 ppm of triplicate determination. ·) Values with different letters differ significantly by Duncan's multiple range test (p < 0.05) std: standard for antifungal activity. E.: Eucalyptus. The PCA horizontal axis explained 73% of the total variance, while the vertical axis a further 14.15% (Figure 5). 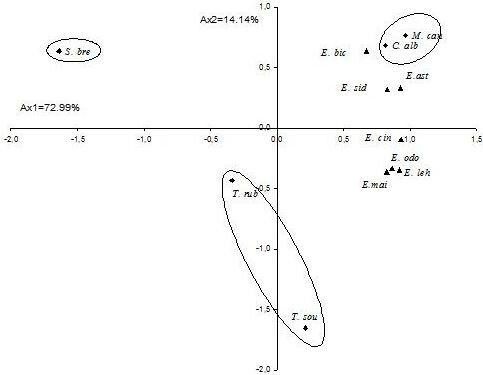 The HCA indicated three groups of species (A, B and C) with a dissimilarity ≥ 5.0 (Figure 6). PCA of the antifungal activity of 0 8 Eucalyptus essential oils species against five fungi (♦): T. rub = Trichophyton rubrum, T. sou = Trichophyton soudanense, M. can = Microsporum canis; S. bre = Scopulariopsis brevicaulis, C. alb = Candida albicans . For the abbreviation of the Eucalyptus species (▴) (see Table 1). Dendrogram obtained by hierarchical cluster analysis based on the Euclidean distance between groups of the antifungal activities of leaf essential oils of seven Tunisian Eucalyptus species. For the abbreviation of the fungi strains, see Figure 5. Group A, limited to Scopulariopsis brevicaulis, correlated negatively with axis 1 and with the group C. This species was distinguishable in the PCA and formed a distinct group. It was considered as being the most resistant to all the tested oils. Group B was formed by Trichophyton soudanense (correlating positively and negatively with axis 1 and 2, respectively) and by Trichophyton rubrum (correlating negatively with the two axes). These strains were distinguished by their highest sensitivity to E. odorata oil (100% of inhibition); however, the variability between these two fungi strains was mainly due to the higher sensitivity of Trichophyton soudanense to E. lehmannii and E. maidenii oils than that of Trichophyton rubrum and also to the resistance of Trichophyton soudanense to E. cinerea oil. Group C, which was formed by the yeast Candida albicans and by the fungi Microsporum canis, correlated positively with the two axes and was characterized by a relatively high sensitivity to E. bicostata, E. astringens and E. sideroxylon; however, these strains showed a higher resistance to the other oils. According to the chemical composition of these essential oils, the antifungal activity was not related to the high content of one chemical compound, rather than to synergic effects between major and minor components. For example, 1,8-cineole, which was discussed above as the principal component of the most essential oils, did not correlate with the high antifungal activity because E. c inerea (70.4 ± 2.5%), E. leucoxylon (59.2 ± 10.1%), E. lehmanii (56.6 ± 4.3%), and E. maidenii (57.8 ± 1.9%) showed a lower antifungal activity than E. bicostata, E. astringens and E. sideroxylon. Additionally, the essential oils of E. bicostata, E. astringens, characterized by the highest content of pinocarvone (2.2 ± 0.5 and 1.8 ± 0.8%, respectively), tr-pinocarveol (4.6 ± 0.6 and 7.0 ± 2.5%, respectively) and globulol (5.4 ± 1.2 and 6.2 ± 0.9%, respectively), showed a lesser antifungal activity than the essential oil of E. sideroxylon. The cytotoxicity effect of the eight Eucalyptus essential oils on Vero cell lines varied significantly within species (Table 5). Vero cells were resistant to the essential oils of E. maidenii, E. sideroxylon and E. cinerea with CC50 values of 253.5, 247.3 and 204.5 mg/mL, respectively. The essential oils of E. odorata, E. leucoxylon, E. lehmannii, E. astringens and E. bicostata demonstrated a different behavior and their cytotoxicity increased considerably with CC50 varying from 6.2 to 16 mg/mL. We did not notice any clear correlation between the chemical composition of the tested oils with the results of the cytotoxic effect and further investigation needs to be undertaken. However, the lowest cytotoxicity was observed with oils having a high content of 1,8-cineole but with a moderate amount of α-pinene and limonene such as those of E. maidenii, E. sideroxylon and E. cinerea. The high cytotoxic effect was shown with E. lehmannii, E. astringens oils, which were characterized by a higher mean percentage of the monoterpene α-pinene and by a moderate mean percentage of 1,8-cineole. The present result was confirmed by Setzer et al. (2006) , who demonstrated that the monoterpene hydrocarbons α-pinene had a stronger cytotoxicity activity against Hs 578 T and Hep-G2 cell lines than 1,8-cineole. It was also observed that a synergic effect among the oxygenated sesquiterpens globulol and viridiflorol and the monterpene hydrocarbons α-pinene of E. astringens, E. lehmannii and E. leucoxylon oils could make the cell lines more sensitive. On the other hand, the significant high cytotoxicity of E. odorata oil could be explained by the latter’s lack of 1,8-cineole and its richness in the ketone cryptone, the monoterpene hydrocarbons p-cymene and in theses aldehydes: phellandral and cuminal . This cytotoxicity effect could be due to the synergetic effect of the previous main constituents of this essential oil. Compared to the previous studies, the cytotoxicity of our studied essential oils was very low CC50 > 20 μg/mL . Therefore they could be considered as being safe for use at non cytotoxic concentrations. *) Values were expressed as a cytotoxic concentration ± SD of duplicate determination. In order to elucidate the mode of antiviral action and to identify the target site, cells were pre-treated with essential oils before viral infection (pre-treatment of cells) and the virus was incubated with essential oils before cell inoculation (pre-treatment of virus). All samples tested were used at their maximum non-cytotoxic concentrations (Table 5). The essential oils of E. sideroxylon, E. lehmannii, E. leucoxylon and E. odorata showed no inhibition of viral infection, whereas the most significant antiviral activity was shown with the essential oils of E. bicostata (IC50 = 0.7 - 4.8 mg/mL) and E. astringens (IC50 = 8.4 mg/mL), followed by essential oils of E. cinerea (IC50 = 102–131 mg/ml) and E. maidennii (IC50 = 136.5 - 233.5 mg/mL). The selectivity index describes the ratio between the cytotoxic and the antiviral activity of a tested sample. The virus pretreatment with E. bicostata essential oil showed a better antiviral activity (IC50 = 0.7 mg/mL, SI = 22.8) than cell-pretreatment (IC50 = 4.8 mg/mL, SI = 3.33). The essential oil of E. astringens showed an antiviral activity only when incubated with a virus prior to cell infection. This activity was dose-dependent and the antiviral activity decreased with the diminishing essential oil concentration. E. cinerea and E. maidenii essential oils showed an antiviral activity at a concentration of 150 mg/mL when incubated with cells. This activity increased significantly at the same concentration when the sample was incubated with a virus prior to infection. According to these results, no correlation was found between the chemical composition and the antiviral assay. Therefore the activity of the tested essential oils could be due to a synergism between the major and the minor components. Altogether, the essential oils used in the present study exhibited the best antiviral effect when incubated with a virus. From the presented results, E. odorata oil was associated with E. maidenii, E. bic ostata, E. lehamnnii, E. astringens and E. leucoxylon oils in both the antibacterial PCA and HCA. However, it remained associated with E. maidenii and E. lehmannii in the antifungal PCA analysis. Therefore, the biological activity has allowed the association of different chemotypes in the same group producing a similar biological activity. This allowed us to deduce that the global biological activity of these oils was mainly due to an addition or a synergism effect between the major and the minor components. This was confirmed by Paster et al. (1995) . The best activity was recorded with E. odorata oil against the majority of the microbial strains with inhibition zone diameters almost equal to those produced by erythromycin against clinical strains H. inflenzae, S. aureus, and to the Pevaryl against the three dermatophytes fungi and the Candida albicans. This property could be explained by the richness of E. odorata oil in p-cymene (16.7 ± 5.2%), terpinene-4-ol (3.0 ± 0.8%), spathulenol (3.2 ± 0.9%), carvacrol (1.7 ± 0.3%), caryophyllene oxide (1.7 ± 0.2%), p-cymene-8-ol (2.9 ± 0.6%), verbenone (0.9 ± 0.2%), viridiflorol (1.0 ± 0.3%), phellandral (6.6 ± 0.4%), cuminal (6.6 ± 0.6%) and cryptone (20.9 ± 1.3%), and by its poverty in 1,8-cineole (4.5 ± 1.6%). It appeared that all the strains were resistant to oils rich in the latter component which varied from 42.0 ± 5.9% for E. astringens to 70.4 ± 2.5% for E. cinerea. On the other hand, oils characterized by a small quantity of 1,8-cineole and by a medium mean percentage of the monoterpene, p-cymene, the ketone, cryptone, the aldehydes, phellandral and cuminal were more active. These results were confirmed by Mulyaningsih et al. (2010) , who demonstrated that the antimicrobial activity of pure 1,8-cineole was inferior to the totality of E. globulus fruit oil, considered poor in the latter component and rich in aromadendrene and globulol. Dorman and Deans (2000), also confirmed that the antimicrobial activity increased with oils rich in aldehydes, ketones and phenols . E. maidenii oil was characterized by a relatively high mean percentage of 1,8-cineole (57.8 ± 1.9%), p-cymene (7.4 ± 2.9%), α-pinene (7.3 ± 0.7%), limonene (3.1 ± 0.2%), α-terpineol (2.2 ± 0.2%), the activity of which occupied the second position after E. odorata oil against all the bacterial strains (7.1 ± 1.5 mm, zdi, for P. aeruginosa to 22.8 ± 6.8 mm, zdi, for S. aureus) and also against the fungal strains with an inhibition percentage varying from 22.8 ± 2.1% for Scopulariopsis brevicaulis to 66.8 ± 17.1% for Trichophyton soudanense. However, oils of E. sideroxylon and E. cinerea, which were distinguished by the highest levels in 1,8-cineole, were less active against the tested microorganisms than the majority of the remaining oils. The present finding was in contradiction with previous studies reporting that 1,8-cineole had strong antimicrobial properties against many important pathogens [44, 45]. It seems that the activity of this chemical compound was inhibited by other minor components. Further investigations need to be carried out to better understand the present issue. According to the study of Claudio et al. (2008), the essential oil of E. globulus has shown a higher antibacterial activity against Haemophilus influenzae (28 mm, zdi) than the tested essential oils in the present study, whereas it possessed comparative inhibition activities against S. pneumoniae (15 mm vs 9.8-17.4 mm, zdi). However, our essential oils exhibited a better activity against K. pneumoniae (6.6-10.7 mm vs 0 mm, zdi), S. aureus (12.2-27.4 mm vs 2 mm, zdi), S. agalactiae (11.1-19.4 mm vs 3 mm, zdi) and S. pyogenes (9–19 mm vs 5 mm, zdi) . Martin et al. (2010) have reported similar findings concerning the antibacterial activity of the essential oils of E. dives and E. staigeriana against Pseudomonas aeruginosa (7.7-9.1 mm vs 6–7.1 mm, zdi) . We also noticed that Microsporum canis is more sensitive to E. sideroxylon oil than that of E. cinerea. This sensitivity could be attributed to the presence of a higher content of α-pinene and limonene and a lower percentage of α-terpineol in E. sideroxylon oil. The comparative study of the antibacterial activity result of the tested oils obtained by the disc diffusion method with the results obtained by micro-well dilution showed for some species a concordance of the two methods and discordance for others, especially against the Gram positive (Gram (+)), S. aureus (278). Compared to the activities produced by the tested antibiotics, all the essential oils were less active. An association of the most active oils together may moderate the activity against the most resistant strains. In conclusion, our study showed that the chemical PCA and HCA analysis separated all the species oils into three groups, each group constituted a chemotype; however, in the PCA and HCA analysis of the antibacterial activity, five groups and sub groups of bacterial strains were identified and separated by their sensitivity levels to the tested essential oils. E. cinerea of the group B was the richest species in 1,8-cineol. However, E. odorata oil of the group A was the richest in cryptone. The Eucalyptus essential oils activity varied significantly within species and within strains. In general, the strong antimicrobial activity was not related only to a high content of one major component such as 1,8-cineole, but also to the presence of moderate and minor compounds. The Gram (−) bacteria P. aeruginosa and K. pneumoniae were the most resistant to all the oils but more sensitive to the antibiotics, ciprofloxacin and ampicillin. Compared to antibiotics and antifungal fosfomycin, ampicillin, rifamycin and pevaryl, the clinical strains S. aureus, H. influenzae, S. agalactiae, S. pyogenes, S.pneumoniae and all the tested fungal strains were more sensitive to E. odorata oil. Taking into account all these results, E. odorata oil provide a promising product in the therapeutic application for the treatment of some respiratory bacterial infections and fungal diseases. The cytotoxicity of the tested oils on Vero cell lines varied significantly within species. E. odorata oil which was the richest species in the ketone cryptone, had the highest cytoxicity, whereas E. maidenii, E. sideroxylon and E. cinerea oils, which were characterized by the highest mean percentage of 1,8-cineole and by a moderate amount of α-pinene, were less toxic. E. bicostata oil had the best antiviral activity against coxsakievirus B3 whenever incubated with the Vero cell lines or with the virus. This essential oil may serve as a potential candidate against enterovirus infections. Further analyses need to be undertaken to test this essential oil on other viruses belonging to the genus enterovirus. However, E. astringens oil exhibited a significant antiviral activity only when incubated with the virus. This shows that this essential oil had a direct effect on the coxsakievirus B3. We could not elucidate the mode of action of these essential oils and their interactions with both cells and the virus remains to be elucidated. This research was supported by the "Ministère Tunisien de l’Enseignement Supérieur, de la Recherche Scientifique et de la Technologie" through the "Laboratoire de pharmacognosie" (Unité de recherche sur la Valorisation des Plantes Aromatiques et Médicinales), "Laboratoire de Microbiologie, Immunologie, EPS Farhat Hachad de Sousse" (Tunisia) and "Laboratoire des Maladies Transmissibles et Substances biologiquement actives" (LR99ES27). AE and ZR carried out the studies, acquired the data, performed the data analysis, and drafted the manuscript. NA performed the cytotoxic and the antiviral assays. YBS played a major role in the experimental procedures of the antibacterial activities. SM and KB MA helped in the experimental procedure of the antifungal activity. FF and R.C offered the material such as (GC apparatus and the Pharmacopoeia European hydrodistilator apparatus) and revised the manuscript. FHS carried out the statistical analysis, and involved in the interpretation of the results and in the final revision of the work. MLK offered us the vegetable material.All authors read and approved the final manuscript.